Which way for ocean fisheries? One of the problems I face is writing a environmental/ecology blog (aside from the fact that nobody reads it) is that whenever I pick a subject to start writing about, I start seeing all sorts of interconnections, inter dependencies, and interactions. The article starts becoming a monster that leads me off in a bunch of different directions and the post becomes a rambling mess. Maybe that’s why no one reads the posts. Oh well. So for today’s subject, I started with a pretty hopeful article from Newsweek Decimated Fish Populations Could Double Across the World by 2050 with Industry Reform. Now, the first thing that struck me is the word could. Lots of things could happen, but how likely are they to happen? So what are the conditions? What kind of industry reform is needed, and then I asked myself the most important question “what are the economic impacts?” since it all comes down to money in the end. To start with, the researchers gathered data from over 4,000 fisheries world wide, and asked 2 questions 1) Is there enough biomass for a sustainable yield today and 2) are their pressures to overfish? In this chart, all the fisheries to the left of the vertical line do not have sustainable biomass, and all the fisheries above the horizontal line have pressures to continue overfishing, Fisheries in the upper left corner (like most of the western Pacific and Northeast Atlantic) are in bad shape and unless changes are made will get worse. 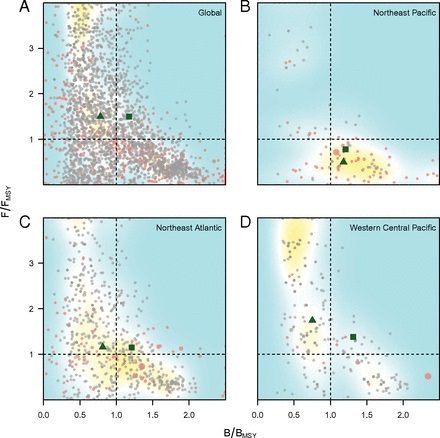 On the other hand, fisheries in the lower right quadrant (see the NorthEast Pacific) have a sustainable biomass and less pressure to overfish. These fisheries are in long term sustainable condition. In 2000, the West Coast fishery for groundfish, such as rockfish and sole, was declared a federal economic disaster. Years of overfishing and declined productivity had led to record-low harvests for some fish and market gluts for others. By all accounts, the industry was dead in the water. The tide changed, however, when the industry began working with federal regulators from the National Oceanic and Atmospheric Administration and scientists from the Environmental Defense Fund (EDF) to put an end to overfishing. They implemented a form of secure fishing rights that divides the total amount of fish that can be caught into individual quotas that each fisherman can catch throughout the year. When a fishery is overfished, most government regulators respond by shortening the fishing season. Pressed for time, the fishermen go out with bigger nets or on boats with more powerful engines in the frenzy to beat competitors after the same catch. The fishermen then flood the market with more fish than there is demand, and excess fish makes waste. Now a new “catch share” program divides the total amount of an overall allowable catch or quota in shares controlled by individual fishermen or groups of fishermen—securing each fisherman’s opportunities and eliminating the need for competition. “When that new program was put in place on the West Coast, all that waste plummeted 75 percent,” says Leland. “It shows that when you give a fisherman a total of the percentage of fish available, he will go out when the weather is good or when market conditions are good, rather than at the same time as everyone else who’s afraid they will miss out. This creates far less waste. So here is the thing that really struck me out this. A number of the Pacific groundfish species that had been endangered are now plentiful, AND the profitability of the industry has improved. Wait, did you just say that environmental stewardship and profit CAN go together? Yes, I did. Look at this chart. The researchers modeled 4 different scenarios to ask which would produce the highest number of sustainable fisheries and which would produce the best profits for the fishing industry. BAU (or business as usual) will lead to severe overfishing AND devastatingly lower profits for the industry. BAU – with a focus on fisheries of concern is slightly better. Bioeconomic theory provides some predictions for the trade-offs across alternative societal objectives of food, profit, and biomass conservation. Perhaps the most salient point is that the three objectives can go hand-in-hand, at least in comparison with a fishery in a depleted state. Wow – environmental protection and profit. Whodda Thunk?